LITTLE ROCK — Each spring, anglers across The Natural State start getting the fever for some fishing action. Sure, die-hard anglers and veteran bass fishermen have been on the water fishing for big fish for the last month or so, and many crappie anglers never put the boat away in winter, but by and large, the best angling action of the year is just around the corner. If there’s a kickoff to “fishing season,” it’s the fast and furious angling action brought on by the annual migration of white bass from large lakes and rivers upstream to their spawning areas each spring. White bass typically start concentrating near the mouths of streams feeding lakes and rivers each year as the surface water temperature begins to reach 50 degrees. When the water warms to the mid-50s, the fish will move upstream as far as they are able and spawn on sand or gravel surfaces with flowing water that will aerate their eggs. The fish actually don’t bite much when they are actively spawning, but feed heavily just before and afterward. Keeping things light is a must for walk-in angling, and Racey has narrowed down his arsenal to some specific lures for people to carry in their pack. Here’s a list of some of the most popular places to try your hand at fishing for white bass this spring, according to the biologists who work and fish on these waters. There’s even one location in this list that has no limit on white bass, so anglers looking to have a family fish fry can load the boat. Typically one of the first locations in the state to start receiving reports about the annual white bass run is Millwood Lake in Little River County. This southwestern Arkansas reservoir is known as one of the best places in the state to chase memorable-sized largemouth bass because of an intense Florida-strain largemouth stocking program that has been in place for decades and its shallow-water habitat that is the key to the strain’s success. The river that feeds this giant reservoir also is home to some incredible action during the white bass spawn if anglers know where to look. According to AGFC Regional Fisheries Biologist Supervisor Eric Brinkman, many anglers enjoy fishing the river section of the lake by boat for fiesty white bass. “Little River anywhere upstream of Yarborough Landing on Millwood is a good place to fish,” Brinkman said. According to the AGFC Weekly Fishing Report, Millwood Lake Guide Service points out McGuire Oxbow and the entrance to Cemetery Slough as likely staging areas, but when the fish move upstream of the U.S. Highway 71 bridge, the spawn is in full force. Other areas on Brinkman’s short list for the white bass spawn include Star of the West Recreation Area and Self Creek on Lake Greeson in Pike County and the Saline River upstream of Dierks Lake in Sevier County, although a boat is required for Self Creek and Dierks. In the far northwestern corner of the state, Beaver Lake offers one of the best white bass runs for Arkansans. It also has the distinction of being one of the few places in the state where you may find a trophy-class striper working its way up the same tributaries as the white bass. Fisheries Supervisor Jon Stein says this year has already gotten off to an excellent start, with many anglers reporting 100-fish days. And keeping those white bass is no issue because Beaver Lake and its tributaries have no daily limit for white bass. The prolific nature of the species and relatively light pressure on the resource have made limits on the fish unnecessary in this corner of the state. White bass also make a spawning run around Lake Conway, but the hot bite may be in different locations depending on water flow. AGFC Regional Fisheries Supervisor Tom Bly and Fisheries Biologist Matt Schroeder both agree that the upstream end of Gold Creek beyond Wilhelmena Cove, a popular crappie-fishing location, in the northwest portion of the lake has a good run of white bass. Another place where anglers can look for some action is below the dam where the lake flows into Palarm Creek. Bly notes the weir on Palarm Creek at Cadron Settlement Park on the Arkansas River sees a similar migration of white bass where the fish moving from the river are concentrated into a small area. 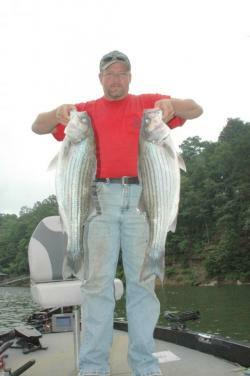 Another good white bass run occurs in the river arms on the northern section of Greers Ferry Lake in Heber Springs. The lake is known as the site of the former world-record walleye, and that species also is known to make spawning runs within the Devil’s Fork, Middle Fork and South Fork of the Little Red River. Chasing white bass on this lake usually means having a boat, but one of the most popular destinations can be found at the Johnson Hole Access of the South Fork arm north of Clinton. Boaters can access the area from the lake or can launch at this access, but the creek has many shallow areas between the main lake and where the whites run, making it a better prospect for small boats, kayaks and walk-in access. According to Bly, many anglers will catch their limits in this section of the river during the annual spawning run. It seems like every year, one location sees more attention than the rest in the state from white bass anglers. Perhaps it is because of its close proximity to Little Rock, or perhaps it is because the white bass run here is just that good. Either way, the upstream end of Lake Maumelle is so popular with white bass anglers and creek fishermen that the AGFC and Central Arkansas Water worked together to enhance access at the west end of the lake. Sleepy Hollow Access was enhanced with a campground, two boat ramps for boats with motors 25 horsepower and less and a courtesy dock. A parking area also was constructed for a special walk-in only area called Bringle Creek Access. Both of these access points can be found with a few miles of where Arkansas Highway 10 crosses the lake’s upstream end. You’d be hard pressed to find either of the parking lots of these areas empty from March through May each year as anglers tote their favorite spinning rod and curly-tailed grubs to fool the fish as they feed along the shoals before spawning. The stream is part of Lake Maumelle, so no wading is allowed, but there is plenty of shoreline to walk and fish. 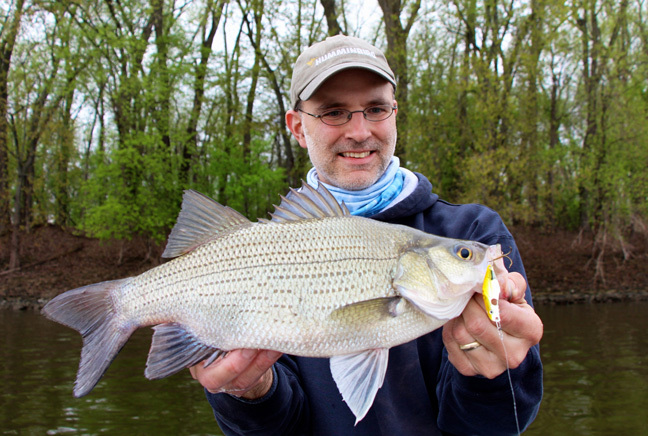 This entry was posted in How To Fish, Striped Bass and Hybrid Bass Fishing, Where To Fish on April 2, 2019 by ronniegarrison. FRANKFORT, Ky. – With all of the rain we received early this year, many anglers are wondering when the white bass run will begin this spring. Reports surfaced last week of a few white bass making a headwater run in the Salt River above Taylorsville Lake, but nighttime temperatures in the 20s this week blunted that movement a bit. Lakes are dropping dramatically, allaying concerns expressed by anglers about the impact on the white bass runs from the record or near record water levels in some of our major reservoirs in February. Nolin River Lake is now just below summer pool, while Taylorsville Lake is still just above summer pool, but dropping rapidly. Hardin explained white bass runs can occur anywhere from 54 to 68 degrees. Water temperatures in major reservoirs now hover just below 50 degrees. The sunny days and huge warm up expected over the coming weekend and into next week should push water temperatures into the 50s. The headwaters of Taylorsville Lake and up into the Salt River make one of the best bank fishing spots for white bass in central Kentucky. The best access is via a parking lot on Palmer Road. It is a matter of walking, casting and then walking a bit more until you find fish. A 1/16-ounce in-line spinner in combinations of silver, white, chartreuse or pink are hard to beat for the Salt River. A pink or chartuese 1/32-ounce feather jig suspended under a bobber and allowed to gently float in the current also scores white bass. The Nolin River above Bacon Creek boat ramp and upstream to Wheeler’s Mill Road (KY 694) is arguably the best white bass run in the state. The white bass in the Nolin River Lake earned an “excellent” rating in the Fishery Division’s 2019 Kentucky Fishing Forecast. A white 2 1/2-inch boot-tailed grub or 3-inch swimbait is a deadly lure for Nolin River white bass. Rig them on a 1/8-ounce head for good casting distance. Broad Ford offers good bank access at the bridge over the Nolin River on KY 1214. Boaters using Bacon Creek Ramp to travel upstream must watch the rocky shoals to prevent motor damage. The headwaters of Green River Lake produce good numbers of white bass up to 14 inches long as does the headwaters of Herrington Lake. Bank anglers may access the Dix River just above the lake at Dix River Voluntary Public Access Area, off Rankin Road via KY 52 between Danville and Lancaster. This area drips with fishing history as Herrington Lake was a white bass mecca in the era after World War II. These waters still produce trophy white bass 14 inches and longer. Small shad-colored topwater propeller baits make great choices for fishing both Green River Lake headwaters and Dix River. The Kentucky River below locks and dams produces surprising white bass action. A 3-inch white curly tailed grub rigged on a 1/8-ounce leadhead makes a great lure choice for the Kentucky River. Keep probing the water column until you find fish. Lock and Dam 2 at Lockport in Henry County grants excellent bank fishing access for white bass. All of the ingredients are now here for the white bass runs to commence. Running white bass, once located, provide as much action as any form of fishing. Remember to buy your fishing license if you have not already. The new license year began March 1. This entry was posted in Striped Bass and Hybrid Bass Fishing, Where To Fish on March 29, 2019 by ronniegarrison. Some of the best white bass fishing in the spring can be done from the bank and while wading in the upper reaches of tributaries. County road maps available from the Texas Department of Transportation, or “The Roads of Texas” (Shearer Publishing, Fredericksburg, Texas (800)458-3808) are invaluable for locating some of the access points described. Always get permission from the landowner if you cross private land to enter a river or stream. Topographical reservoir maps are often available from controlling authorities or at retail fishing stores. White bass in Texas are currently managed with a statewide 10-inch minimum length and 25-fish daily bag limit. Canyon Lake, an 8,308-acre reservoir located just north of San Antonio, has a strong spring white bass run in the Guadalupe River above the reservoir. Rebecca Creek boat ramp is located in the river, and anglers with small boats can easily access the area without crossing open water. Off State Highway (SH) 306 (past the lake) turn south on Eagle Rock Drive which becomes Tanglewood Trail. Go 2.3 miles, and take the first road on the right past “Chapel in the Cove”. Rebecca Creek boat ramp is at the end of this road. Most anglers head upstream to an area called “the rapids” but other areas can be good and less crowded. Look for high spots in the river channel that concentrate fish as they move upstream. The area around Cranes Mill Park is legendary in the winter and early spring as white bass school up, staged for the spawning run up the river. In late spring check the mouth of major creeks. Main lake fishing can also be quite good. The island near Comal Park and humps near the dam are good during the summer. There are many good boat ramps available. For those without a boat, a fishing pier at Crane’s Mill Park is a good option. For more information, contact the U. S. Army Corps of Engineers at (830)964-3341 or the Texas Parks and Wildlife Department at (512)353-0072. Lake Georgetown is a 1,297-acre impoundment of the San Gabriel River located just west of Georgetown. White bass fishing in the spring can be excellent if water conditions are right at Tejas Camp, which is located on County Road (CR) 258 between Farm to Market (FM) 305 and SH 183. In addition, anglers can access the entire southern and most of the northern shoreline of Lake Georgetown from Tejas Camp via marked trails. Three public boat ramps are available on the main lake as well. For more information, contact the U. S. Army Corps of Engineers at (512)863-3016 or the Texas Parks and Wildlife Department at (512)353-0072. Granger Lake is a 4,009-acre impoundment of the San Gabriel River located just east of Granger. A good place to access the upper river for spawning white bass in the spring is Parking Lot 7. From SH 95, go east about 1.5 miles on county road 347 until it T’s, then turn right. No ramp is provided, but small portable boats can be launched. Shore anglers can also access the river at a pull-off on county road 347 about ¾ mile east of SH 95. Be careful, because the bank is steep. Willis Creek is another option for anglers and can be accessed at two locations. Head east on FM 971 from SH 95 at the town of Granger. Take CR 348 south, to Parking Lot 4, which is by the bridge over Willis Creek. The second location is Willis Creek Park, which provides full-service camping, shore angling, and a boat ramp year-round. Take CR 346 east from SH 95 at the sign for the park and follow the signs. Four other public boat ramps are available on the main lake. For more information, contact the U. S. Army Corps of Engineers at (512)859-2668 or the Texas Parks and Wildlife Department at (512)353-0072. Lake Limestone, located 50 miles east of Waco between SH 164 and SH 7, is a 13,860-acre impoundment of the Navasota River. It provides cooling water for the Houston Power and Light generating plant. In addition to opportunities for schooling white bass throughout most of the year, white bass migrating up the Navasota River to spawn are especially vulnerable in the spring. There are four public boat ramps on the main lake. For more information, contact the Brazos River Authority at (903)529-2141 or the Texas Parks and Wildlife Department at (254)666-5190. Lake LBJ, located near the town of Granite Shoals, is a 6,449-acre impoundment of the Llano and Colorado Rivers. Both rivers can be accessed from two fee boat ramps in the city of Kingsland. Riverbend Marine and Storage ramp is accessed via Harris Loop, directly across from the Llanorado Lodge just west of the CR 1431 bridge crossing. The Kingsland Lions Club also maintains a ramp. Take Euel Moore Drive off of CR 1431 (there is a sign advertising the ramp at the turn-off). Go about ½ mile and take a left on Williams street. This road ends at the ramp. The Llano River directly above Kingsland is popular with fly anglers targeting white bass. For more information, contact the Lower Colorado River Authority at (800)776-5272 or the Texas Parks and Wildlife Department at (512)353-0072. Lake Somerville is an 11,456-acre impoundment of Yegua Creek located about 25 miles southwest of Bryan/College Station. 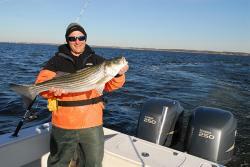 It provides outstanding white and hybrid striped bass action, particularly in the spring. Beginning in early to mid-February, both species migrate up reservoir tributaries, primarily Yegua Creek. The lower reaches of Yegua Creek can be accessed by boat from the main lake, but two public areas provide access for the shore angler. Newman Bottom is reached from SH 21 at Dime Box by taking FM 141 south. Turn left on FM 1697, then left on CR 125 to CR 140. Follow the signs on CR 140 to a self-pay, day use only, parking area. Irvin Bridge can be accessed by following the same directions to get on FM 1697, and then turn left on CR 124 to a primitive parking area on Yegua Creek. During the summer months, numerous “humps” and main-lake structure provide hot-spots for white and hybrid striped bass anglers. For those limited to fishing from shore, Welch Park on the main lake provides good opportunities for bank and wade fishing. For more information, contact the U. S. Army Corps of Engineers at (979)596-1622 or the Texas Parks and Wildlife Department at (979)822-5067. Lake Travis is an 18,622-acre impoundment of the Colorado and Pedernales Rivers located just west of Austin. Traditionally, strong white bass runs have occurred on the Pedernales River. Travis County Milton Reimer’s Park provides bank, boat, and wade fishing opportunities to the public. The park is located on Hamilton Pool Road (CR 3238), about 11.5 miles west of the intersection of Hamilton Pool road and SH 71 and 1.3 miles east of the low-water bridge over the Pedernales River. Anglers should contact Travis County Parks for more information on this park (512-854-7275). The area near Pace Bend Park, where the Pedernales River enters the lake, is always a good bet for early season deep water jigging spoon fishing. The area upstream from The Narrows boat ramp, located on the upper reaches of the reservoir, as well as the area directly below the Lake Marble Falls dam can be very good during the spring, if there is adequate water. This area should be boated with caution especially if the reservoir is below normal pool. The Narrows boat ramp is located west of Austin, near the town of Spicewood on County Road 411. Some of the bigger creeks in the lake also have good white bass fishing. These include Sandy, Cypress and Cow creeks. The main body of Lake Travis is good during the winter for fishing lighted boat docks. At least nine public boat ramps provide access on the main lake. For more information, contact the Lower Colorado River Authority at (800)776-5272 or the Texas Parks and Wildlife Department at (512)353-0072. Lake Waco is a 7,173-acre impoundment of the Bosque River located in the city of Waco. White bass migrate up the North, South, and Middle Bosque Rivers in the spring, resulting in dense concentrations and excellent opportunities for anglers. Six boat ramps provide access on the main lake. For more information, contact the U. S. Army Corps of Engineers at (254)756-5359, or the Texas Parks and Wildlife Department at (254)666-5190. Lake Whitney is a 22,180-acre impoundment of the Brazos River located approximately midway between the cities of Fort Worth and Waco. White bass run up the Brazos and Nolan rivers, with best angler catches below sand and gravel bars and along sandy shorelines. Sixteen public ramps provide access on the main lake. A popular spot for white bass anglers is Kimbell Bend Park, which has a 2-lane boat ramp and is located just off of SH 174. For more information, contact the U.S. Army Corps of Engineers at (254)694-3189 or the Texas Parks and Wildlife Department at (254) 666-5190. Lake Buchanan is a 22,211 acre reservoir located in Burnet and Llano Counties near the town of Burnet. It is the uppermost reservoir in the Highland Lakes Chain and has excellent white bass and striped bass populations. The Colorado River above the lake has one of the strongest white bass runs in Central Texas. For wade or bank fishing Colorado Bend State Park, near the town of Bend, is a great place to try your luck when water conditions are right. This portion of the Colorado River is popular with fly anglers. Bend is located about 20 miles out of Lampasas on SH 580. Call the park (325-628-3240) to check on conditions before going. Several private fishing camps in the Bend area also have bank access. Signs in the town of Bend will direct you to the camps. The area from Silver Creek (also called Beaver Creek) to the town of Tow is an excellent choice from winter to late spring. Buchanan has lots of main lake structure to try during the summer months. Public and private boat ramps are located on the lake. For more information, contact the Lower Colorado River Authority at (800)776-5272 or the Texas Parks and Wildlife Department at (512)353-0072. The authors wish to thank Texas Parks and Wildlife Inland Fisheries employees Floyd Teat and Mark Webb for contributing to this report. This entry was posted in Striped Bass and Hybrid Bass Fishing, Where To Fish on March 14, 2019 by ronniegarrison. by Petty Officer 2nd Class Nate Littlejohn, U.S.C.G. A cluster of small boats gather toward the end of an ebb tide on a dreary November evening in Norfolk, Virginia. Fishermen, clad in rain slickers, cast their lines toward pilings and retrieve them in silence. There’s no chatter among them – an entire day spent on the water exhausted their conversations. They’re focused on one thing – their target species, the Atlantic striped bass, though nobody’s landed one today. Suddenly, the song of a reel zings out over the rushing water as a striper is hooked and begins what might be the fight for its life. “Hooked up!” exclaims an angler, finally breaking the silence with words they all yearn to shout. The fish peels just enough line to make a beeline for a piling, wrapping the monofilament against the barnacles plastered to it like living razor blades. The line snaps, leaving the fisherman to grieve in the gloomy dusk. For anglers across the U.S., the challenge of locating and landing stripers is what keeps them coming back for more. “Striped bass are an elusive fish,” said Dwight Ocheltree, a striper fishing enthusiast and employee at Greg’s Bait Shack in Portsmouth, Virginia. His statement applies in more ways than one. 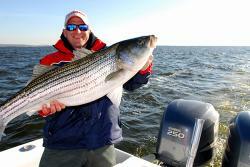 Striper fishermen know finding these fish isn’t always easy. Sometimes it’s a patience game of waiting for them to show up or to start feeding. Then there’s the challenge of landing one after it’s been hooked. According to Ocheltree, once a fisherman lands a striper for the first time, it’s then he or she who will be hooked. “Once you land one, you’ll be back for more,” he said. “If you’ve been trying but aren’t catching any, keep at it. Keep plugging. You’re one cast away from the best day of your life!” Anglers hoping to catch “the big one” are drawn to waters off the Mid-Atlantic coast, where laws aimed at protecting the species are different that those close to shore. Coast Guardsmen, charged with protecting living marine resources, enforce an important federal law designed to protect the Atlantic striped bass population. While striped bass fishermen are responsible for understanding and following both state and federal regulations, the majority of these anglers will never venture near the three mile mark, fishing closer to shore in rivers and bays. One particular characteristic of the species helps make it the preferred target for so many. Stripers are anadromous – they’re born in fresh water, migrate to the ocean, then return to fresh water to spawn. This means anglers can catch them in rivers that run through cities – they’re a popular urban game fish. Their ability to acclimate and survive in entirely freshwater ecosystems led humans to introduce the species to completely landlocked lakes and ponds. Striped bass can be found throughout the country and are among the most targeted of all game fish. This entry was posted in Saltwater Fishing, Striped Bass and Hybrid Bass Fishing on December 29, 2015 by ronniegarrison. If someone told me the fishing would be worse at West Point for the Flint River tournament last Sunday than it had been two weeks before in the Sportsman Club tournament I would not have believed them. I could not believe it would get harder to catch a bass, but it was. 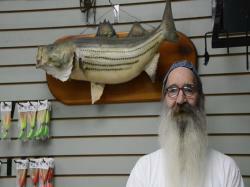 In eight hot hours of casting 13 members and guests of the club brought in nine keeper bass weighing about 15 pounds. There were no limits and eight people didn’t catch a keeper. Only four of the bass were largemouth. Niles Murray had two nice largemouth weighing 7.32 pounds for first and the one that weighed 5.82 pounds was big fish. My four, three spots and one largemouth, weighing 4.47 pounds was second, Jack Ridgeway, Niles partner, had one largemouth weighing 3.46 pounds for third and Chuck Croft had a spot weighing 1.43 pounds for fourth. My partner Jordan McDonald had a spot weighing .95 pounds for fifth and that was it! Jordan and I started on a bank where I have caught fish before, hoping a bass would be feeding at daylight. We tried a variety of baits and Jordan got one hit on a topwater plug but missed it. After about 45 minutes as we worked out to a hump off that bank Jordan spotted schooling fish hitting on top across the creek. I told him they looked like hybrids and, based on where they were feeding over deep water, I was sure they were. But we went over there and sure enough Jordan caught several hybrids on a jerkbait and I missed a few on a topwater plug that was too big for them to eat. Then Jordan hooked a strong fish that fought for a long time before pulling off. We tried some more humps near deep water without a bite. Then we went to the point where I had caught two good largemouth two weeks before. The baitfish were still there and fish were under them, just like before, and we got some bites, but all we caught was a six inch spot and a warmouth. About 9:30 we went to a roadbed and fished it hard and caught a couple of short spots on jig head worms. Right at 11:00 I caught a 13 inch spot and then landed a second one the same size in the very next cast. Although we stayed there for over an hour we didn’t get another bite. Just after noon we went to another point where I had caught a spot two weeks before and I saw baitfish with fish holding under them in 18 feet of water. I got a hit on my drop shot worm under them and landed a keeper largemouth. As soon as I put it in the livewell I dropped my bait to the bottom, felt a fish start swimming with it, set the hook and broke my line. I have no idea why it broke. Although I was using only eight pound test line the first fish had pulled drag without breaking it. On the second fish my line popped with almost no pressure. I may have nicked it while unhooking the first fish. At 1:00, with an hour left to fish, we ran to a brush pile in deep water where we had seen fish two weeks before but had not been able to catch anything. We rode over it and saw a lot of fish holding on it on the depthfinder. I put out a marker and as soon as Jordan’s dropshot hit bottom he caught his keeper. While he was putting it in the livewell I dropped my bait down and caught my fourth keeper. Although we stayed there until we had to go in at 2:00 we did not get another bite. That was frustrating because we could see the fish holding around the brush but they would not bite. I can’t recommend a bass fishing trip to West Point right now, but if you want to catch some hybrids it would be a good choice. The big school we saw was in the mouth of Turner Creek, just behind the island in the mouth of it. Be there at first light and they will hit small topwater plugs, jerk baits, spoons and crankbaits. After the sun gets up and they quit schooling on top they will suspend over the channel and you can jig for them with spoons or bucktails, or catch them on live bait. You should be able to spot them on a depthfinder holding about 20 feet deep. Hybrids fight hard and most of them will be fairly small, around two pounds. But the one Jordan lost was much bigger and you will have some of them, too. I don’t eat many hybrids since they taste so strong, but some folks like them fried. When I do cook them I put filets from a three or four pounder in a pan, cover them with bacon strips and onion rings and bake them for about 45 minutes. I do like them cooked that way. The bacon and onions give them a good flavor and takes the strong fishy taste out of them. This entry was posted in Bass Fishing, Striped Bass and Hybrid Bass Fishing, Tournament Fishing on July 22, 2015 by ronniegarrison. How Can I Catch White Bass? You’d be hard-pressed to find an avid angler who doesn’t recognize bass as the most sought-after sport fish in North America. We all have our favorite fish, but statistics prove that bass are #1. Overlooked and underappreciated, however, is a bass of a different color. Its DNA differs from the most popular, yet the species roams a majority of waterways throughout the lands. I’m talkin’ white bass…. And they are a blast to catch. Eight-year-old Mae Edlund is all smiles during the Mississippi River white bass blitz! An H20 Precision Jig and minnow or B Fish N Tackle Pulse-R is like candy to these voracious pelagics! White bass fans look forward to massive spring spawning runs in rivers that connect to the large natural lakes and reservoirs the fish call home during the rest of the year. But after the run, most anglers set their sights on other species. So why are they summer’s Rodney Dangerfield, earning such little respect? It can’t be their unwillingness to whack a vibrating or flashing lure. The fact is, white bass have voracious appetites, and once schools are located, the catching comes quite easy. It’s certainly not what they lack during battle. White bass zig-zag and power-dive straight for the fathoms. And, by far, it’s not their poor table fare. On the contrary, white bass make for good eats if you ice ‘em right away or keep them in a well-aerated livewell – and then remove all the red-colored flesh when filleted. More than likely, it’s simply because they aren’t easy to find come summertime. Just like their saltwater cousins, the striped bass, white bass turn pelagic. They don’t dwell near bottom or hug shoreline structure, making them more difficult to find. Instead, white bass rove high in the water column and create havoc with pods of nomadic baitfish. Or maybe they’re simply not trendy enough to target. But that’s about to change. Enter ardent angler Jim Edlund, who is far from troubled to speak in favor of targeting white bass. The Minnesota-based outdoor writer says he fishes white bass every chance he gets, and now coaches his daughters on how to catch them year-round; even well after the massive spawning migrations have ended. Although spring can be easy pickings, Edlund says good electronics can help you find white bass the rest of the year. As Edlund nears the waypoints he marked on Side Imaging, he switches to split-screen view of 2D sonar and LakeMaster map, noting the depth marks start appearing, more than likely the same depth white bass will move into if the wind kicks up and waves roll over sunken islands or points adjacent to the deeper water. “I can’t tell you how many times I’ve stopped jigging walleyes on the Mississippi River to chase a school of white bass. I have buddies who just shake their heads. Then out comes the casting stick for as long as the whities will play along. Overall, once white bass have spawned, they move out into the main lake and can be found in areas with a turbid layer over ultra-clear water. In reservoirs, both bait and bass are often found along the old river and creek channels. In natural lakes, white bass tend to hover over main-lake flats. It’s in these areas you may see baitfish leaping for their lives, indicating there are white bass below attacking the clan. “Although electronics are great, always pay attention to what’s going on around you, like busting bait and surfacing fish. And watch where the birds are feeding on the water,” says Edlund. Once it’s determined the bass are at the surface or just below, it’s time to cast into the chaos. Lures and gear should be beefed up from what one might expect when catching fish that range from 1-4 pounds. Because white bass feed on shad and shiners, lures that match the size of the baitfish are best. Vibration and flash are key as well. Soft jerkbaits with large paddle tails, such as 3.5-inch Castaic Jerky J Swim Series and Custom Jigs & Spins 3.25-inch Pulse-R Paddle Tail, rigged onto a jig head with a narrow shape like an H20 Precision Jig, or the Rapala Ultra-Light Rippin’ Rap are some of Edlund’s favorite baits to cast. He throws them with 10-pound-test superline and an 8-pound-test fluorocarbon leader on a fast-action medium-power St. Croix AVID-X spinning rod. Spinners are also a great choice for whities, with number-3 and -4 Mepps Aglia in-line spinners mainstays. 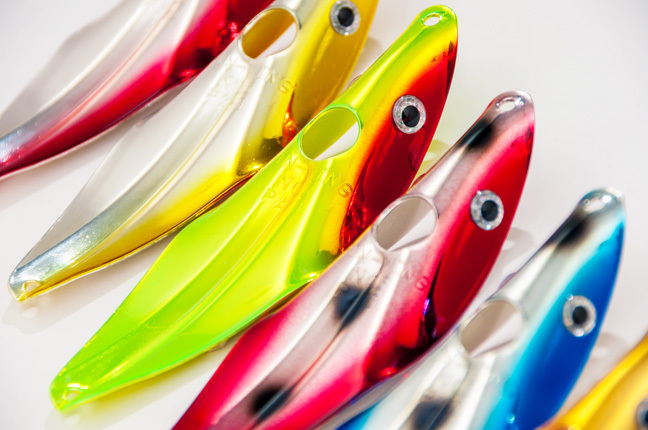 Spoons with a wide wobble that can be fished both fast and slow and can be stopped and fluttered on the fall, such as a size-1 Fin-Wing or Custom Jigs & Spins Pro Series Slender Spoon, work wonders, too. Overlooked and underappreciated? That’s the white bass. Once located high in the water column, catching them is straightforward – just cast, retrieve and repeat. Once you land a few you’ll realize just why white bass should rank right up there with black and brown bass. Mitch Eeagan is a writer that lives off the land and water, who resides in the heart of the mosquito-filled cedar swamps of Michigan’s Upper Peninsula. This entry was posted in Fishing Tackle, Striped Bass and Hybrid Bass Fishing on May 30, 2015 by ronniegarrison. March Madness is here, but that means something totally different for fishermen. To us it means crappie are in the shallows spawning, bass are moving shallow and are much more active and being on the water can be downright comfortable after the miserable cold winter. And catching will be good for at least the next two months. You can fill your limit of 30 crappie quickly most days by dabbling a minnow or jig around shoreline bushes or other wood cover. They can also be caught by trolling shallow stump flats and drop-offs. This is a great time to fill your freezer with these good tasting fish. Bass are about as easy to catch as they get. You can catch them on crankbaits, spinnerbaits, worms and jigs. Go about half way back in a cove or small creek and start casting to any wood or rock cover in fairly shallow water and you will catch fish. Stripers and hybrids are feeding better, too. They start running up rivers in area lakes and also congregate near the dam. They can be caught by trolling or jigging spoons or jigs over deep water, and you can often find gulls diving on fish feeding on or near the surface. The fishing reports from Georgia lakes I post on my site each week reflect this good fishing. All say fishing is good right now, and they offer a variety of tips on what to fish on that specific lake, where to fish and what to expect. They will say the fishing is good until at least early June. And my favorite way to fish is about to get right. I love to cast a topwater plug, and as soon as the water temperature hits 55 degrees I will start using a popper or buzzbait. It will be even better when the temperature goes above 60 degrees, but you may be surprised at the strikes you can get when it is still a little colder. Yesterday the Flint River and Spalding County clubs had our youth/buddy tournament at Jackson and today the Sportsman Club is fishing our March tournament at Oconee. Then on Thursday I go to West Point for three days of practice and the FLW Top Six on the following Monday and Tuesday. I will miss fishing only three days out of 11 so I will get in almost enough time on the water. Both the Flint River Bass Club and the Spalding County Sportsman Club are sending six man teams to the tournament so 12 of us will be there competing for individual and team prizes. I really enjoy fishing the Top Six each year and hope this is a good one. This entry was posted in Bass Fishing, Crappie Fishing, Striped Bass and Hybrid Bass Fishing on March 27, 2015 by ronniegarrison. Can I Catch Stripers In Cold Water? If you’re brave enough to get out on the water anywhere north of Florida this month, you may have a bit of Inuit in your ancestry–or perhaps you fished from an ice shanty. Cold weather not only makes it almost impossible to endure sitting in a bass boat, it shocks the fish into a state that resembles suspended animation; they simply hang in the water near bottom, nose down, moving only enough to stay upright. They’ll come back to some semblance of normalcy after a few days of more temperate weather–but it will be the end of February before bassing returns to normal, even in Mid-South states like Tennessee and the Carolinas. However, there are some species less affected by the cold. Top among them is striped bass, which actually thrive on cold water, and these may be the best target for the next month in many lakes around the country. Stripers feed almost entirely on shad in open water and can be tough to find, but fortunately many lakes in winter have some “bird dogs” that make it easier. Sea gulls that winter from the Mason-Dixon Line southward keep a sharp eye out for shad being driven to the surface by stripers, and anywhere you see a flock of gulls diving–or even sitting on the water–it’s likely there are stripers below. Striped bass are native to the TVA lakes that stretch across Tennessee, Alabama, Mississippi and Kentucky, but numbers were strongest when they were heavily stocked years ago. Now, most found here are native-spawned; the long flow-way of the TVA rivers allows the eggs to hatch in years when there’s good rain. Tennessee is also continuing to stock upstream TVA lakes, and some of these fish, as well as their eggs, arrive in North Alabama’s TVA lakes as a result. Stripers, as distinguished from white bass, have a longer and more streamlined body shape, and grow to much larger sizes–over 50 pounds on occasion, and the world record for the landlocked strain, caught from the Black Warrior River last February, is a stunning 69 pounds, 9 ounces! Caught by James Bramlett, that 45.5 inch fish is unlikely ever to be bested; it appears to have lived in the warm water outflow of the Gorgas Steam Plant where it was able to stuff itself on swarms of shad and other baitfish prowling there to keep warm. It was built like a basketball with fins. Stripers of 15 to 20 pounds are not that uncommon, and the average size is 7 to 10 pounds, big enough to give most freshwater anglers the fight of their lives. Fishing live shad or shad-type lures under the sea gulls is one of the best ways to locate these fish in winter. You may have to visit several gull flocks before you find one with active stripers below, but running main channels near dams or in larger bays will eventually put you on the fish. A check of the sonar can confirm bait and stripers below–these large fish have a very obvious signature on the screen. Stripers are great eating if cleaned properly, far better than largemouths, which most conservation-minded anglers release anyway these days. Stripers have snow-white flesh that’s much like that of a saltwater grouper–just peel away the skin, cut out the red line and the rib cage and the boneless fillet is ready to be grilled, baked or broiled. This entry was posted in Saltwater Fishing, Striped Bass and Hybrid Bass Fishing on February 13, 2015 by ronniegarrison. Do Women Like Saltwater Fishing? So your wife, girlfriend or daughter wants to try fishing? How you handle her initial experience can make all the difference. “Daddy, take me fishing,” are four words any fishing father loves to hear from his son, but it has become a more common refrain from daughters-and it’s just as welcomed. In fact, it’s not just daughters showing a greater interest in the sport, but women across the spectrum. That’s a great thing! While fishing is still a male-dominated sport, there has been a steady increase in the number of women fishing alongside men, and a new breed of distaff anglers who get out there and do it on their own. Tangling with a big striper takes skills for success, and both men and women need a bit of instruction before they hook up the first time on a fish this size. How you manage any newcomer’s introduction to fishing will have an effect on their perception of the sport and their desire to become more involved. With that in mind, there is no one better to consult on this subject than Betty Bauman, founder and CEO of Ladies Let’s Go Fishing (LLFG). Betty started fishing as a child and shares a deep love of the sport. Throughout her fishing experiences, she has moved from cane poles and ponds to saltwater. The knowledge and skill she has acquired along the way, combined with her winning marketing skills and outgoing personality, have helped her share her passion for fishing with other women interested in getting started in the sport. Her award-winning seminar series, which she affectionately calls the “no-yelling school of fishing,” has successfully introduced over 5,000 women to saltwater fishing. There is nothing more frustrating than putting a rod and reel in the hands of someone who has never fished before, expecting them to be able to use it on the water. For an experienced angler, the tools of the trade might be old hat. But for someone who has never fished before, something as simple as operating a reel or feeling a bite can be challenging. If you don’t alleviate the potential for frustration from the beginning, novice anglers simply won’t have a good time. And if he or she doesn’t enjoy the initial experience, chances are unlikely you will gain a new fishing buddy. Saltwater fishing is a different ballgame from freshwater, requiring bigger boats, motors and tackle-but it’s at least equally fascinating with a good teacher or two. Betty explained that it’s important for the experienced angler to become a teacher. Stop and think about why you go fishing and convey that message as clearly as you can. “You have to explain the whole world of magic that emerges when you’re fishing, and do your best to paint a picture of that magic before she sets foot on a boat,” she advised. Tell her about the fish you plan to catch, and show her pictures of them. Tell her about the habitat they live in, what they eat, and how you plan to fish for them. Let her know there is so much more to fishing than the act of fishing itself. There will be opportunities to commune with a wide range of sea life; birds, porpoises, sea turtles and hundreds of species of fish, while you’re out on the water. 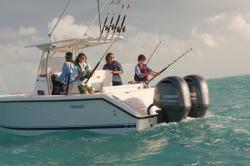 It broadens the experience and takes some of the emphasis off catching fish. Spend a little time explaining the various techniques: trolling, casting, jigging, bottom fishing. Don’t just show her a lure or a bait rig and tell her this is what we are going to use. Explain how it works and how to use it. She won’t remember everything – no one can. (You didn’t in the beginning either.) But that’s not important first time out; it’s just a good way of showing her that fishing, like any sport, isn’t as easy as it might look. It requires some education and experience to become proficient. The time for instruction is before you actually get on the boat to go fishing. Teach her about the tackle you plan on using for her first on-water experience, and let her handle it. Show her how to operate the reel, and explain how it works in conjunction with the rod, not just as a casting tool, but as a fish fighting tool. Explain the principle of the drag system and how it comes into play to prevent the line from breaking when a large fish is hooked. Giant stripers like this one don’t come along every day, but when they do, any angler can truly appreciate them. If she is not familiar with the boat and how to fish from it, there is that much more to explain. You can also explain how to control a fish at boatside, whether it is to be netted, gaffed or released. Tell her why a lot of fish are released either voluntarily or because of regulations. And be sure to cover the importance of wearing appropriate clothing so she is comfortable for her first fishing experience. Clothing will vary depending on where you are fishing and the time of year, but it is an important topic. Be sure she brings sunglasses and sunscreen, and if there is any chance she might have a predilection for seasickness, simple over-the-counter remedies are cheap insurance for a nice day on the water. Plan her first fishing experience to appeal to her, not you. Pick a target species that is abundant, easy to find and requires simple skills to catch. Consider keeping the time on the water brief instead of forcing her to get up at sunrise and drag herself back after a ten-hour day on the water. The most important thing for any newcomer to the sport isn’t catching a big fish or great quantities of fish, it’s catching a fish – period. For that reason, you might consider a morning or afternoon of bottom fishing with simple bait rigs that don’t require a lot of casting. 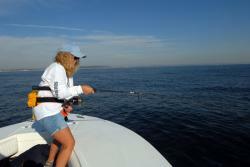 Pick a nice day, anchor on a productive spot, bait her hook, have her drop it to the bottom. Explain what a bite feels like and how to set the hook when she feels one. All she has to do is catch a fish or two, and you’re well on your way to fulfilling all her initial expectations of fishing. From there it’s a matter of moving forward at a pace that is comfortable for her, and seeing how her interest grows. You might be surprised when she starts asking you to teach her more and mentions trying different types of fishing for different species of fish. After all, it is the most addictive of sports whether you’re a man, woman or child. If you’d like to learn more about Betty Bauman and her educational seminars for women go to www.ladiesletsgofishing.com. This entry was posted in fishing basics, Striped Bass and Hybrid Bass Fishing on December 29, 2014 by ronniegarrison.